Can be CPU hungry. A/B morphing requires precise settings. A powerful source of sonic manipulation options. Source filter is a dab hand at vocoder-style effects. 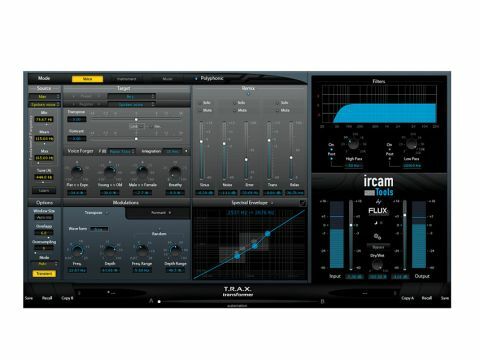 IRCAM Tools is a new range of plug-ins covering positional room acoustics simulation (Spat), more straight-up reverberation (Verb) and real-time audio manipulation (TRAX). Here we're focusing on TRAX, which is shorthand for transformation and cross-synthesis and comprises three plug-ins: Transformer, Cross Synthesis and Source Filter. Each uses IRCAM's Super VP phase vocoder technology. Of the three plug-ins, Transformer is not only the most complex and feature-rich but also the most recognisable in its aims. You'll find Source and Target controls: the parameters of the former are dialled in according to the characteristics of the input signal, while the latter are used to set the pitch, formant and timbre characteristics of the resulting output. There are three processing modes: voice, instrument and music. These affect not only how the results sound, but also the options available. "The mixer is enlightening, letting you balance pitched, non-pitched and transient components." The music setting only offers pitch and formant adjustment, whereas 'voice' mode includes six gender/age presets for source and target, and eight register presets (eg, soprano, tenor and bass) for shifting pitch. Advanced features include the Voice Forger, which enables you to correct the tuning of (ie, autotune) your original signal to fit a scale. Common to all three modes are two octaves (up or down) of pitch and formant shifting, LFO modulation of pitch and formant (not tempo syncable, unfortunately), spectral envelope, the output mixer, oversampling (x1 and x2), high and low-pass filters and a dry/wet control. The mixer is particularly enlightening, letting you balance the pitched (Sinus), non-pitched (Noise) and transient (Trans) components of the signal. Also rather smart is the spectral envelope, which you can use to redistribute frequency content. Finally, Transformer lets you store two complete patches, A and B, and morph between them using the crossfader. The other two plug-ins - Cross Synthesis and Source Filter - have more straightforward controls. Both take in two independent mono signals, producing a single output (ie, duplicated in the left and right channels). Cross Synthesis is the simpler of the two, using the amplitude and frequency spectra of both source signals to determine the output signal. The primary controls are Amplitude and Frequency sliders, enabling you to control the influence of each source. Controls can be linked in inverse fashion. The Source Filter is similar to a vocoder, with the left input being the source or 'excitation' signal, and the right input dictating the filter. Additionally, there are 'temporal envelopes' that determine the influence each source's dynamics has on the output. Both the Cross Synthesis and Source Filter plug-ins are available in stereo only, whereby you have two inputs (left and right) and one combined stereo output. As Flux suggest, the best solution to this problem is to stick the plug-in on a bus and send your signals into it, panned left and right. Once you're set up, both plug-ins are pretty straightforward. We found that Source Filter could achieve excellent vocoder effects, and special mention has to be made of the 'true envelope' option. This setting seemed to make the whole process much easier to dial in than it is on a traditional vocoder plug-in. The temporal envelope setting also assists with getting exactly the right balance of attack. Cross Synthesis is a slightly different affair. With no preconceptions of this sort of processor, we experimented with lots of combinations, with variable results. We ultimately found that the most exciting noises were produced when we combined a transient-heavy sound (a drum loop, for example) with a more legato sound. However, we found that whatever we did, the results tended to be quite 'phasey'. Our best results involved using our DAW's automation to morph between two different settings. Getting the best results from Transformer requires you to specify a range for the fundamental frequency of your source audio. You can set this manually, using one of the presets, or with the Learn option, with which you run a few seconds of audio through the plug-in and it susses out the frequency range automatically. With the frequency set, we have to say that the results on our vocal test recording were excellent. Whether simply shifting pitch in real time (with no change in timing) or switching timbre using the target presets or advanced controls, we could bring age or youth to a female vocal very successfully (although we must admit that changing it to a male voice did sound a little suspect). The expression of the vocal can be adjusted, ranging from flat (ie, monotonous with minimal pitch deviation, like a robot) to full, where vocal pitch fluctuations are exaggerated. For sung vocals, flattening can be used to effect, although increasing the expression tends not to be as much use because it can push vocals out of tune. On spoken (or rapped) material, though, it's much more useful - you can also use automation to pick out certain syllables or words. We'd imagine that post-production houses will find this useful on occasion. Transformer's other options, such as modulation and the spectral envelope, are a tad redundant for typical vocal tasks, being more suited to sound design and way-out effects. We found these options most useful with drum loops by hitting pitch and formant extremes or using the spectral envelope to manhandle frequency content. The mixer is also great for balancing things in favour of transients. From a creative perspective, we found processing pitched instruments less inspiring (although it's still excellent for pitchshifting). There are a number of additional settings that can influence the processing engine, including oversampling. They can also all have a reasonable impact on CPU usage, as Flux acknowledge. However, combine them with the A/B morphing and the resource hit can be pretty problematic. This issue led us to steer clear of the oversampling options, and we also learnt to avoid trying to morph between patches with fundamental differences in their settings (eg, different processing window sizes). Overall, TRAX is an interesting package, and is as good as any we've heard for real-time pitch and timbre shifting. Additionally, Source Filter delivers excellent vocoder type effects. However, to get the most out of TRAX, you'll definitely need a powerful computer. Transformer: Starting with a female vocal and the 'young woman' source setting, we then switch through various target presets - woman, young man, girl, boy, man. Next, back to young woman but with a register shift - mezzo soprano and contralto. Back to normal pitch and then sweep advanced controls - old/young, female/male, breathy, flat/expressive (with chromatic tuning), flat/expressive (with recto tuning). Now use the global pitch shift for down then up one octave, and finally use the mixer to hear the 3 main signal parts - sinus, noise and transient. Source Filter: Starting with a synth pad and our vocal, with the plug in set to true envelope mode. First adjusting the window size from small to large, then the temporal envelope moving the balance towards the smoothness of the pad. Now adjusting the mix level of each signal, and then the maximum frequency of each. Finally back to the window size again to fine adjust the intelligibility of our sound. Cross Synthesis: Starting with a drum loop and synth pad, we're trying various settings starting with amplitude for each channel then frequency. Next morph between two settings, and finally try different window settings. Note, having different window settings is undesirable as it makes morphing glitchy.